What is your impression of the day-to-day of a Buddhist monk? Your visualization may make it appear that the monk-life is a vast departure from modern society, and you’d be pretty close to the truth. However, we can draw inspiration from the way they live their lives. If you are looking to bring more mindfulness and peace to your days, then we can look to these simple Zen Buddhist-inspired rules to live by, no matter what your spirituality or religion. Take steps, rather than multi-tasking. For example: when eating, just eat. When bathing, just bathe. “When walking, walk. When eating, eat.” – Zen proverb. Now that you’re doing one thing at a time, don’t rush it. Instead, take your time, move slowly, and act deliberately. Focusing like this is surprisingly difficult for someone used to rushing around doing a million things at once. Practice makes perfect, though. You’re doing one task slowly and deliberately, now make sure you follow through and finish it before moving on to the next. If it is impossible, at least try to put away and clean up the unfinished task so that it doesn’t interfere with your next movements. The Buddhist Monk’s day starts early and is filled with work. However, the task list is not unending. Today has its tasks, and no more. If you are completely filling your day with ‘to-dos,’ you’ll be rushing around from one thing to another without being mindful at all. Now that you’re managing your schedule to allow time for finishing tasks mindfully, try to leave room in between things. You can rest here, meditate, or even finish something that took a little longer then expected. To the Zen Buddhist, rituals exist for everything from the sacred to the mundane. Rituals surrounding cleaning are as important as the rituals surrounding meditation. Actions are done because they are important to do, and if they are important enough to take time out of your day, then they are worthy of your entire attention. Certain times of day in the Monk life are for certain activities. For example, bathing, working, cleaning and eating all take place in their time to make sure they are done regularly. You can designate time like this for your own regularly-occurring activities. Sitting meditation (zazen) is vitally important in the life of a Zen Buddhist. Slices of every day are set aside for this practice, and it will teach presence and living from moment to moment. 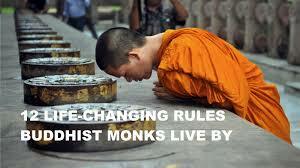 Monks spend parts of every day in service to others. This teaches humility and helps leave selfishness behind. In the same way, the practices of smiling and kindness help to improve the lives of those around you, and your own. Meditate While Cooking And Cleaning. Besides zazen, cooking and cleaning are the next two most important moment of the Zen Buddhist Monk’s day. Both are good practices in mindfulness. If you find these boring or a chore, try to surround them with meditation and ritual. Put your mind to them, focus, and do them completely. You may change your mind about these tasks. Live Simply With Your Necessities. While we are not Zen Monks, it is good to look at how they live as an example. There is little in their lives which is not necessary – clothing, shelter, utensils, tools, and simple vegetarian food. While extreme, their example allows us to think about what we have that we don’t need, and whether we can jettison some of the excess weight of our possessions. The other side of the topic above is that if something is unnecessary, you can live without it. Try to make it a goal to rid yourself of as many unessential things as you can. Remember, it’s up to you to decide what is essential. So if you have a vast library that you study, this is probably essential to you. If you have a collection that is your passion, this is probably essential. Even though another person may see that as clutter, it’s not up to them to decide. The point is keeping what’s important, and ridding yourself of excess weight.